I have a whole bunch of layouts to share with you today using the Page Evans Take Me Away collection. Looking back over the layouts, I'm surprised that more are not pink and at how much green I used but I'm happy with the lot I have created. I still have another couple of layouts that could be made from the range too! The first layout I created was not what I planned but my obsession with sewing and die cutting made me do it. This is a pretty soft and quiet page for me with the lovely woodgrain background tho I could not help adding lots of the beautiful pearly hearts from the thickers. I added one of the little paperclips as well, these are so sweet. The next layout is the layout I planned on making to start with, well the photo and all the layers beneath. I didn't like how it was turning out tho so changed things up and used the lovely green ombre background. This is a bit unusual for me in that I have three photos on this layout but they all need to be there to tell the story (despite having already told the story in my project life, sometimes I just need to tell it twice hehe). 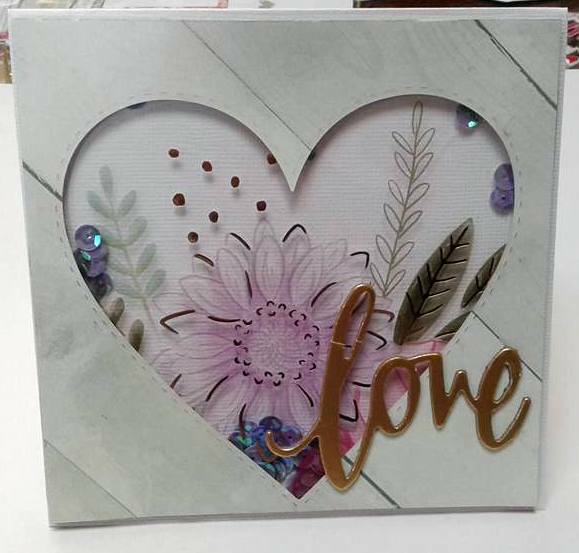 I decided to go with a diagonal design and added some of the yummy chipboard from the collection in both corners to balance it out. The pearly thickers made another appearance, oh I just love these ones! I had a bit of a break from this range but came back with a vengeance and created 4 more layouts plus 1 project life layout over about four days...Isn't it strange how sometimes coming back to something brings a lot more inspiration? Oh and a card! My third layout was a totally difference look. I decided to pull the yellows and greys from the collection and I did plan on not adding anymore colour but wanted to add the chipboard floral piece so I decided a little bit of pink and green would be ok. This layout is part of the December challenge for the Paper Teapot facebook group but I won't tell you what the challenge is! It was going to be a pretty minimalistic layout too but as usual, I couldn't stop myself and once I started adding floral bits, I thought...heck! It's a photo of my graduation and wreaths are sort of scholarly right, lets form a wreath around the photo. Hah! So I did, and I love it, but then I really really really love wreaths. I also added the yellow tassel from one of the Paper Teapots embellishment packs...so cute! I do need to add the date yet, it was a long time ago so I need to find my degree! Scary..it was almost 20 years...eek! The next thing I wanted to tackle was the stunning acetate. I'm sure I am not the only person who has this and thought it was lovely but wondered how to use it. I knew I would not use it all in one layout so I fussy cut one bunch of florals out and them looked at what to use behind this. I started with white cardstock and this would have been lovely but because I was using this beach photo and I had another piece of green ombre paper, I tried the floral over this. I was pleasantly surprised with how it looked as I thought it might have altered the floral colours too much. I really wanted the lovely woodgrain paper on this layout too so matted the entire layout with it. There was the cute cutapart that I decided to use as my title adding on the word sweetheart with letter stickers and the final touch was the bow from the chipboard sheet. Another not so embellished layout....I have been restrained! My next layout is the one that took me the longest and was the hardest to complete. I've never been very good at sticking to things when I get bored. There...I admit it! hah! My mother used to get pretty frustrated with me as I wanted to do things but then once I had tested it...that was it, over it and didn't really care anymore. I guess that is why my scrapbook is full of lovely things and why I enjoy it so much because I can get something done and then be on to the next thing. Now, I do enjoy cross stitch, I really do, even tho it takes ages. My mother will be pleased to hear me say that as her love is embroidery. However...cross stitching on a piece of paper is NOT for me. I admire Paige Evans hand stitching on her pages but I'm for sure not going to be one of those scrappers. EVER! I was bored of stitching about two minutes into it because it took longer than I expected and was trickier than I thought. But I finally finished this layout using the cross stitch design as my template. Here is a close up of the stitching. I added some watercolours using the packaging technique and Tim Holtz inks. My next page was a pocket page and I used a green paper as my background and cut it into pieces to fit the pockets. I used a few embellishments from my stash including butterflies from the WRMK wildflower collection which is one of my favourite ever collections. My final page, I used a lot of large pieces of paper on and machine stitched around them all. I used the same green paper as I used in the pocket pages...this seems a shame as the reverse side is a jolly nice woodgrain! And that is it. Except for the shaker card I made using a heart die cut left over, some of the acetate and sequins from The Paper Teapot embellishment packs. This was fun..and I don't make cards!